Coconut oil has been lauded as a great cooking oil because of its healthy ratio of fats and high smoke point, but it can also transform your beauty routine. 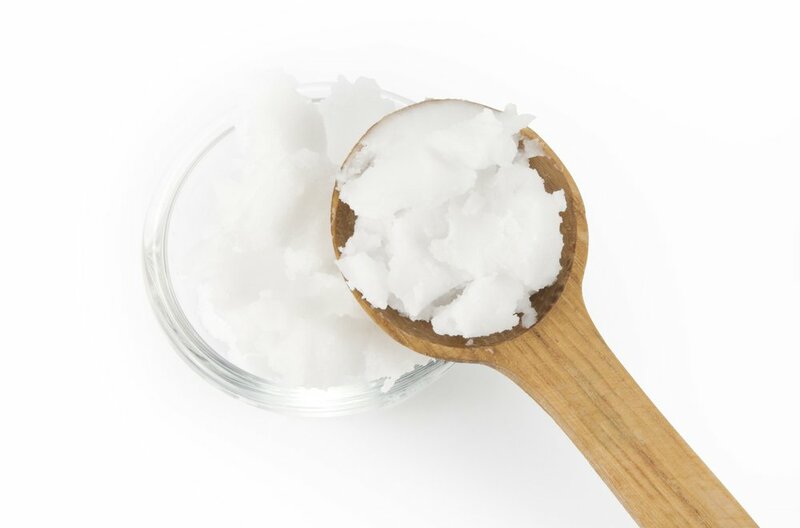 Full of healthful oils and antioxidants, coconut oil is particularly helpful for your hair. Whether you tend to have oily hair or dry, frizzy locks, coconut oil can make your hair shiny and radiant with health. What Makes Coconut Oil So Healthy? Coconut oil is produced from the “meat” of the coconut (Marina et al., 2009). The oil is white when in its solid form, but it melts when it is heated above 76 degrees Fahrenheit. In its liquid form, it is a rich, colorless oil. Good quality coconut oil smells just like a coconut, although versions that have been bleached or refined may lack this distinctive smell. Coconut oil also contains linoleic acid, linolenic acid, and oleic acid, which are healthy unsaturated fats (Organic Facts, 2015). Hair should have a natural shine and glow, resisting tangling and matting. Unfortunately, a combination of dietary factors, lifestyle choices, and poor hair care can lead to less than healthy hair. One of the most common hair complaints is that hair becomes too dry. Straightening or blow-drying can sap moisture from the strands of your hair. This causes them to become brittle, making them more prone to breaking or split ends. Other people have a problem with oily or greasy hair. Although the scalp naturally produces an oil called sebum, some people have sebum production that goes into overdrive. This causes hair to look limp, greasy, and lifeless. Despite being an oil itself, coconut oil may help your hair from becoming too greasy. When we use shampoo to clean our hair, it actually strips away its naturally protective moisture. This can cause the outer layer, or cuticle, of the hair to become dry. When the cuticle pulls back from the hair strand, it causes split ends. One of the reasons that coconut oil is so healthy for hair is that it is 94% fat (Organic Facts, 2015). The fats in coconut oil can penetrate each strand of hair, restoring lost moisture. In particular, the medium chain fatty acids are good at restoring lost moisture to hair. Coconut oil can even protect your follicles from heat or other damage, meaning that the very roots of your hair will be more healthy. Coconut oil is also brimming with beneficial vitamins, minerals, and antioxidants that can restore health to lackluster hair. For example, coconut oil is high in vitamin E, vitamin K, zinc, and iron (Self Nutrition Data, 2015). These vitamins and minerals have been shown to improve scalp health, increase oxygenation of hair follicles, and promote hair strength and health. Finally, coconut oil is a natural antibacterial and antifungal substance (Marina et al., 2009). This prevents the development of bacteria on the scalp that can weigh hair down from its roots. There are many ways to use coconut oil for hair care. One of the best ways to begin is with a moisturizing hair mask (Dr. Axe, 2016). This is particularly helpful for people with dry or damaged hair. While in the shower, take a small dab of coconut oil (perhaps 1 tablespoon) and rub it between your hands. Smooth the coconut oil through your hair from roots to tips. Massage your head with your fingertips to work the coconut oil into your scalp. Then, leave the mask on for 5 to 10 minutes before rinsing your hair. Adding a drop or two of essential oils to the coconut oil may help to fight bacteria or fungi while simultaneously adding a pleasant aroma to the hair mask. Interestingly, coconut oil can also help people with greasy hair. For greasy hair, mix a small amount of coconut oil with a few drops of lemon juice and an equivalent amount of grapefruit juice. Before shampooing, apply this mixture to your scalp, rubbing it into the scalp before working it through your hair to the very tips. Let it sit for a few minutes before shampooing your hair as usual. This will prevent the shampoo from clinging to your hair, dragging it down and making your scalp more greasy. Anecdotally, people also report that using coconut oil can prevent hair loss (York Morris, 2014). Although there are no scientific studies supporting coconut oil for this use, it cannot hurt to try it on your hair. At the very least, coconut oil causes hair to look shinier and healthier, which improves its volume and may give the appearance of slowed hair loss. Discover more benefits of coconut with our article on the drupe or with the delectable coconut oil recipes below. Uncertain about grabbing a jar of coconut oil for hair care? Don’t trip, chocolate chip! Simply slip on your apron and bring this versatile oil into the kitchen to make all manner of confections. Discover a world of possibilities with the fabulous coconut oil recipes below! A great option for a filling breakfast with a seldom enjoyed but always beloved flavor, these flapjacks offer a fantastic way to start the day. Ingredients: Brown rice flour, coconut flour, almond milk, egg, coconut oil, lemon, sugar, baking powder, poppy seeds. Not a fan of lemon poppyseed? While, we don’t believe you, we all need variety in our life and these matcha pancakes offer just as much with the ideal sweet treat to start the day. Ingredients: Almond milk, brown rice flour, egg, sugar, coconut oil, matcha green tea powder, hemp protein powder, butter, greek yogurt, walnuts, almonds, banana chips, cranberries, golden raisins, maple syrup, cacao powder, baking powder. This superb spread is ideal for sandwiches, savory marinades, or a simple dip for veggies, crackers, and fruit. Plus, you can keep using this delectable butter for weeks! Another brilliant way to start the day or to keep your energy levels up with a snack that’s both sweet and savory, our banana bread recipe is simply unbeatable. Ingredients: Overripe bananas, eggs, coconut oil, applesauce, almond milk, honey, vanilla extract, brown rice flour, coconut flour, walnuts, gluten-free rolled oats, baking soda, baking powder. Another quick pick-me-up for those that prefer the redolent savor of dark chocolate, these bars contain the superfood goji berries to supply a natural energy boost! A dessert that can be enjoyed anytime, this apple crisp utilizes the natural sweetness of apple to create a sugary treat that won’t make you feel guilty. Ingredients: Apples, arrowroot powder or cornstarch, lemon juice, gluten-free rolled oats, almond flour, dried blueberries, macadamia nut pieces, maple syrup, coconut oil, cinnamon powder, vanilla extract, salt. Another dessert centered around a wholesome ingredient, this almond cake is moist to supply a satisfying treat. Enjoy a slice with a glass of almond milk for even more almond goodness! Ingredients: Eggs, almond milk, unrefined sugar, almond flour, coconut flour, coconut oil, baking powder, baking soda, vanilla extract, sliced almonds. These jam bars are great for a mid-afternoon treat, a contribution to your next potluck, or a simple dessert. You’ll love the incredible tastes and textures this treat has to offer. Why bake when you can create a delectable sandwich cookie without any cooking at all. These palatable pistachio cookies will change the way you prepare desserts. Ingredients: Pistachios, unsweetened shredded coconut, gluten-free rolled oats, maple syrup, moringa powder, water, vanilla extract, cashews, almond butter, vanilla, coconut oil. Blueberry crumb bars are another classic plate that combines the wholesome sweetness of blueberries with a soft and savory base for a treat that will drive you wild. Ingredients: Almond flour, coconut flour, coconut oil, agave syrup, water, baking soda, blueberries, arrowroot powder (or cornstarch), brown rice flour, ground cinnamon, sugar. Standard cookies are made all the more enjoyable with a healthy twist. These cranberry and almond flour cookies add a hint of tart taste to the sweetness for a full, rewarding flavor. Ingredients: Brown rice flour, almond flour, rolled-oats, dried cranberries, egg, coconut oil, sugar, vanilla extract, baking soda. Another cookie recipe that makes use of wholesome ingredients, these cranberry cookies blend their sweet and sours with the creamy pistachio nut for a delightful crunch in every bite. Ingredients: Almond flour, brown rice flour, egg, sugar, coconut oil, dried cranberries, pistachios, baking soda, vanilla extract. Did someone say chocolate? Oh, yes, we did. This scrumptious confection is packed with the rich flavor in a moist morsel that is sure to have your mouth watering. Ingredients: Almond flour, brown rice flour, cacao powder, eggs, almond milk, coconut oil, unrefined sugar, vanilla extract, baking powder, baking soda, hazelnuts. Pecan pie is a classic way to end a feast. A scrumptious delight that is topped with a crunchy source of essential nutrients is a satisfying dish indeed. Ingredients: Almond flour, coconut oil, honey, eggs, pecan halves, coconut sugar, maple syrup, vanilla extract, butter, salt. Perfect for those hot summer days and nights, these palatable popsicles combine another classic pair with chocolate and mint for a frozen treat that will quickly become a favorite. Searching for the right essential oils and juices to blend with your coconut oil can be made a lot easier when all the ingredients are all in one place. Find many of the components needed for your beauty products below. You can’t make a coconut oil hair mask without the primary ingredient! Our oil is organic, raw, and extra virgin to ensure that it is the highest quality you’ll find anywhere. Organic hemp is been cold pressed to provide a pristine essential oil that is ideal for use in cooking or to add essential nutrients to your diet. White truffles not only produce a delicious oil that is ideal for seasoning all sorts of foods, but they are also a source of readily extractable unsaturated fats- which shines through in this wholesome oil. Our powdered citric acid can be used in place of lemon juice to offer a dry and easily utilized alternative to the cumbersome fluid. Try it today! Tartaric acid is found in grapefruits along with citric acid, to provide a more accurate representation of the fruit’s juices when the two are used together. Marina, A.M., Che Man, Y.B., Zazimah, A.H., Amin, I. (2009). Chemical properties of virgin coconut oil. Journal of the American Oil Chemistry Society, 86, 301-307.